The Journeyman Project is a time travel first person view adventure game by Presto Studios. It is set in the future, where a temporal agent discovers anachronisms created by someone altering the past, and must travel through time to fix the timestream. It was originally released for MacOS in 1993, and was released as a faster running version called The Journeyman Turbo for Windows in 1994. 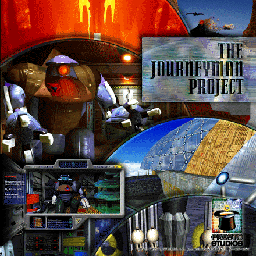 In June 1997, a remake was created for MacOS titled The Journeyman Project: Pegasus Prime. It was also released for Bandai Pippin and PlayStation, but only in Japan. This remake featured enhanced puzzles, sounds, and music, and utilized actors from The Journeyman Project 2, but retained the story of the original game. The Journeyman Project: Pegasus Prime was later released as a further enhanced version with higher resolution graphics and videos and the gameplay enhancements from the PlayStation version. This new version of The Journeyman Project: Pegasus Prime was released for MacOS on December 27, 2013, for Windows and Linux on DVD on March 28, 2014, and through digital distribution on April 10, 2014. The original Mac version of The Journeyman Project: Pegasus Prime is now supported by ScummVM, a program designed to let 2D adventure games run on multiple platforms. With ScummVM, The Journeyman Project: Pegasus Prime now runs on modern versions of windows, as well as Linux, Mac OS X, and many consoles such as Dreamcast, Wii, PlayStation 2, and PlayStation Portable. For a complete list of platforms supported by ScummVM, see here.